Spoiler alert! If you are the Colorado Makechnies, you must go read another blog today. Really, shoo shoo. For the rest, here’s one of my favorite gifts: Books. We don’t buy Christmas gifts for every single family in our immediate family. Every year we rotate. This year we have Glenn and Kim and their two adorable boys, 4 and 1. It’s sometimes hard to think of gifts that are useful and wonderful, exciting and fun. My hope is that 4-year-old Tate will love unwrapping and reading a book each day and Finn will love crumbling and eating the paper! Everybody wins. I went Christmas book hunting at my favorite used book store, looking for only brand-new quality books. It was extremely difficult for me to focus only on the Christmas books because I kept finding fantastic classics like Ferdinand and Little House on the Praire, in a large print, picture form for $1. I bought them both for later 🙂 I have serious self-control problems when it comes to books. 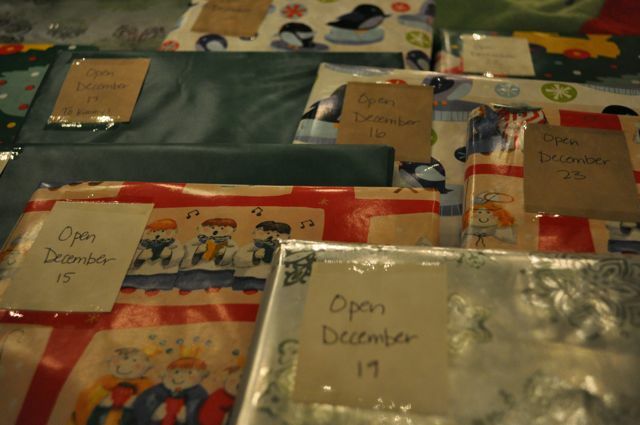 I found 9 Christmas books, and wrapped them all individually. 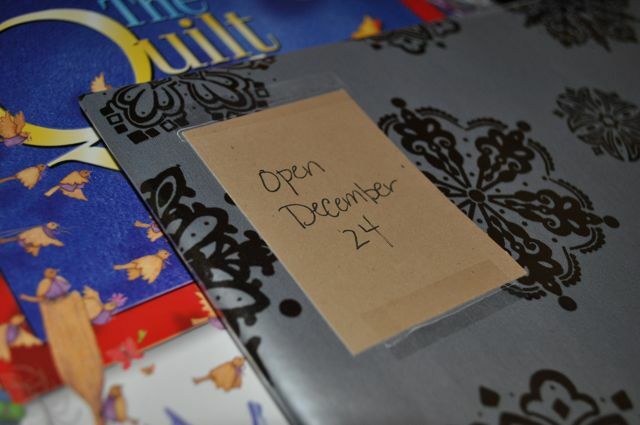 Then I wrote out little count-down labels, starting on December 14th-December 24th, for which day to open which book. The tenth book was for Mama Kim, Deliberate Motherhood. And papa Glenn got a Santa Mouse coloring book. Won’t he love that? 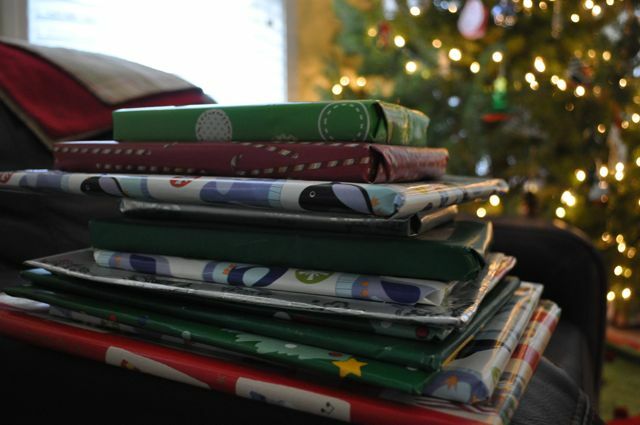 My kids have a basket of Christmas books we only bring out at Christmas, but now they say we have to wrap them up for our own little countdown. And I’m inclined to do it as that won’t be so exciting in a few years. Packaged, and mailed. 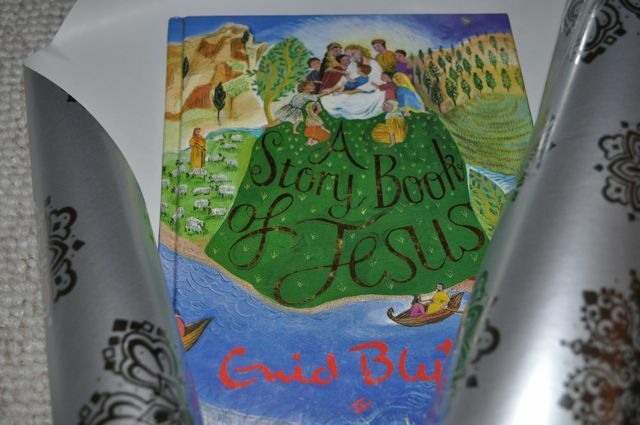 Here’s a link for 50 great Christmas books. My favorite Christmas book continues to be the one my mother read to us when I was about 10, The Best Christmas Pageant Ever. This entry was posted in Books, Christmas, gift idea, kids on December 4, 2012 by maisymak. OMG! Ferdinand! I love it! I’m a serious children’s book fan, too. There are way too many to put in a “best of” list. BTW, I love the name Finn. Two of my favorite books as a child were “The Wizard Children of Finn” and “The Lost Legend of Finn.” I just re-read them to my kids. So good! I love this idea – I could really run with this one. You know we’re doing that in our house right?! I wrapped all their Christmas and advent books up and we open one every night before bed and read it out loud together. The boys are LOVING it (and so am I)! I’m sure Tate and Finn will loving getting all those books! So cute! Wait, they’ve already plowed through the basket! Maybe next year? I also love The Best Christmas Pagent Ever. very fun! I love many of those books, too. 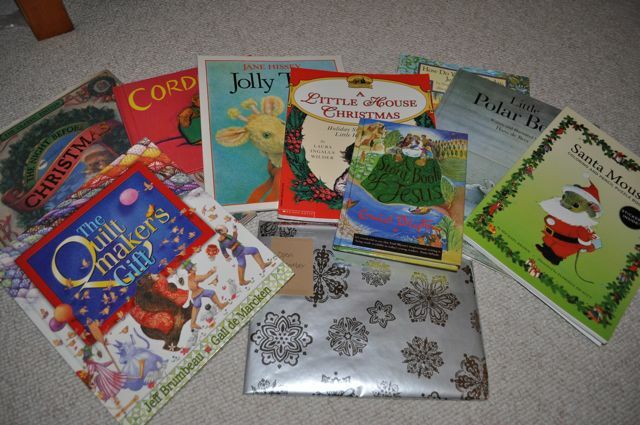 We have a collection of Christmas books that we read every year, and I haven’t added to it in a long time. Thanks for the ideas! I did a blog post today with 4 of my favorite books for the Christmas season. One of them was “The Best Christmas Pageant Ever”. I remember one year we did the play in church and it really was the BEST EVER!